I went to both my in-laws and parents house for thanksgiving dinner, then cooked my own thanksgivig dinner on Saturday. I had planned to use Alton Brown's brined turkey recipe, but I had almost none of the spices. I wound up getting a commercial brining mix with similar ingredients and soaking the bird in it overnight. In the morning i stuffed an apple, an onion, cinnamon stick, sage and rosemary in the cavity while the bird cooked. I will absolutely be brining my turkey from now on. The turkey was moist, flavorful and tender, the best turkey I've ever cooked by a wide margin. It also has room for improvement by adjusting spices--I think it had a bit too much rosemary. I also made twice-baked garlic-rosemary potatoes. (Bake potatoes, cut in half and scoop the insides without damaging the skin. Mash, add flavors and butter, put the mash back into the skin, cover with bacon and cheese, bake again) Again, very good, but with a little too much rosemary. The meal was great, especially considering all the experimenting that I did. I was talking to my brother on Thanksgiving, and he mentioned a federal scheme that is (as usual) being abused--A subsidy on electric vehicles can be fairly easily used to get a free golf cart. The dealer puts bumpers and lights on it, the Feds accept that as transforming it into an "electric vehicle" and the subsidy equals or exceeds the cost of the cart. You don't have to actually use the cart for anything. I thought Cash for Clunkers was about as stupid as they could get. Now I only wish it was. About 2 months ago, I switched the firmware on my router from the stock Linksys to Tomato, an open source, Linux-based router project. The results have been fantastic. I had been having trouble where once or twice a week I would have to reboot the router to get it to work properly. Tomato has an option to reboot itself--I set it to reboot every morning at 4am, and I have not had to reboot it manually since. I don't know if it is necessary, or if Tomato is just more stable on its own, but it works and doesn't bother me so I'll leave it. Quality of Service (QoS) is a router feature that allows different priorities for different types of internet use, and keeps one use from blocking others. I didn't bother setting up QoS when I first installed Tomato, but this morning my internet was very slow because my wife is using Bittorent. I logged on the router, checked the "enable QoS" checkbox and then the Save button. Took about 30 seconds. Web browsing speeded up dramatically, with no noticeable change in Bittorrent. The default settings appear to work very well here, although other sources say that they can be vastly improved. They give priority to the most common web usage, while giving Bittorrent and similar whatever is left-sort of like a traffic cop giving top priority to ambulances, and making sure that semi trucks leave plenty of room for regular cars. So the end result is more useful features, more stability without sacrificing ease of us or requiring a steep learning curve. I'm very pleased. It has been decades since I've bought a pocketknife--Instead, I've relied on the blade from my Gerber multitool. My current job needs a knife frequently throughout the day, so I wanted something that would open quickly and easily, and that would clip to my pocket. I was initially set on an assisted opening knife, but after playing with a Gerber Liner Lock that was on clearance at Walmart, decided it was good enough for what I wanted, at a very good price. I was unfamiliar with the modern liner lock system, although long ago I've had knives with the type of lock they evolved from. The older style was a traditional pocket knife, where the blade was held in position by a spring on the spine. These required some effort to open and close. The lock was a brass-colored spring that snapped into place when the blade was fully open. The lock did not rigidly hold the blade in place, but it did prevent it from closing unless you pushed the lock aside. One problem was that the pressure would suddenly decrease as the blade began to close--this could catch the finger pushing the lock aside if you did not maintain a firm hold on the blade while closing. Until I experimented with the knife I bought, I was not aware of how much better the modern liner lock system is. With the liner lock, the spine spring is removed, and its functions accomplished with a ball detent and the lock itself. The blade is held in the closed position by a tiny ball detent, with the majority of the pressure removed after the tip moves a quarter inch or so. There is little friction until the blade reaches the full open position, when the lock snaps in place. Once the lock engages, the blade is effectively a fixed blade. Because of the greatly reduced friction in opening, the thumb studs easily generate enough force to quickly open the blade, either with only thumb pressure, or with both thumb pressure and a wrist flick. One-handed closing is much safer than the old version as well. When the lock is pushed aside, resistance is low but constant until the blade reaches the fully closed position. The back of the blade has a raised section with a tooth pattern. This naturally allows the index finger to easily close the knife up to about 45 degrees, although only a small amount is necessary. At this point you can remove your thumb from the lock and use it on the thumb stud to finish closing. Closing the blade beyond 90 degrees with the index finger along the back is difficult. Additionally, even if your thumb were to remain in place, the first part of the blade to contact the thumb is a notch behind the sharp part of the blade. I am not thrilled with the easily-damaged black paint on the blade, and I wish the pocket clip was reversible, so I could more effectively carry this in my left pocket. However, for the price I'm happy. After making the Trader Joe's beer bread, I decided to try the recepie from Kevin Baker at The Smallest Minority. Very easy, very good, just a touch sweeter than I would prefer. Mix the flour, sugar and beer. You will wind up with a stiff batter. Put in a buttered loaf pan and smooth the top a bit. Dump melted butter on top, bake at 350 for 1 hour. A couple of weeks ago in the middle of the night, something started chirping, then turned to a constant beep. I finally got out of bed to figure out where the noise was from, but it stopped before I could find it. Went back to bed, and of course it started up again a bit later. It turned out that one of the buttons on my electronic deadbolt was intermittently pressing itself. The lock took this as someone trying to break the combination, and complained. I took the batteries out and went back to bed. Later, 10 minutes on Google didn't turn up any parts available, and I'm trying to be extra frugal, so I decided to roll my own. Trader Joe's beer bread mix. Surprisingly good, even made with cheap malt liquor. Dense, good crust, not quite as stretchy or chewy as I'd like. A little too sweet to use as a sandwich bread, but really good with butter. 45 minutes to bake, about 5 minutes prep time--Add beer to mix in a mixing bowl, stir until mixed but not too much, dump in a greased loaf pan, dump melted butter over the top, bake. Directions claim anything carbonated will work, I don't think I would use sweet pop, but plain seltzer might be good. The traditional political spectrum is left vs. right. This is overly simplistic. A slightly more nuanced view is 2 dimensional--the same left vs. right, but also an up/down, with libertarian/anarchist at the top, and authoritarian/statist at the bottom, giving a square diagram. I forget which episode, but on the Vicious Circle podcast someone said that the proper diagram would be a triangle--As you move towards libartarianism the left vs right difference matters less and less, because there is less government, and therefore a larger chance that whatever it is you are worried about will fall outside the scope of government intervention. I used to work with a very fundamentalist Christian-According to him, the bible says it is wrong for women to rule over men, homosexuality is an abomination, etc.. I wound up convincing him that religion should not be a basis for government policy by asking him "What do you think the chances are that the particular version of government Christianity used will match yours?" The same basic thought works regardless of belief system. 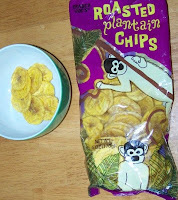 These plantain chips look like Banana chips, but taste pretty much like slightly nutty potato sticks. If you are expecting banana, the first bite is very strange. Once you clear your expectations, they aren't bad. Probably won't get them again, but I'll finish them.